Salmon fishing on Lake Michigan these days is about as good as it gets. Limit catches are very common during the months of July and August; and although the fish may not be as big as they were forty years ago, the fish are as abundant as anytime since. 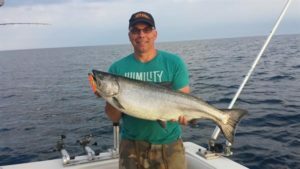 But if you are to be a successful salmon angler, you must understand the feeding patterns of a Lake Michigan king salmon. What works in the morning may not work an hour later, and what works in the shallows may not work in deep water. Learning to make adjustments at the correct times can be the difference between a full cooler, and an uneventful boat ride. I’ve talked to many anglers who only fish the first few hours of daylight because they say they can’t hook any fish after the old haymaker rises above the dunes. The first shades of light in the morning and the waning moments of the evening definitely are a very special time when the baitfish are active and kings are aggressively pursuing them, but it is not the only time that the fishing can be outstanding. Anglers must simply adapt the proper their tactics as the fish change their feeding habits throughout the day. On an average morning on Lake Michigan, king salmon are generally taken high in the water column, usually above 50 feet, with some even coming within 10 feet of the surface. This early morning flurry is a time for surface lines, short lead-cores, shallow set downriggers, and high running dipsy divers. On most days lure choice is not all too critical; when the fish are in a feeding frenzy, anything that squirms, wobbles, swims, or glows will likely catch fish. But when the fish disperse after that early morning feeding frenzy, every detail becomes critically important. Speed will now become more important, as will lure choice. But by far the most important change in your spread will be the depth you should be targeting. Most boats that fish salmon nowadays have three types of presentations: downriggers, dipsy divers, and long lines (lead core, copper line, drop weights, etc.). Once the bite slows it is time to start lowering your spread. Start by lowering the downriggers because it can be done very quickly, without taking any rods out of the water. Adjust them downward in ten to fifteen foot intervals, and continue lowering them every twenty minutes or so until they catch fish. Don’t be afraid to go very deep, it is not uncommon to take kings 175 feet down or more. Many anglers who see fish on sonars at this depth immediately guess them to be Lake Trout, but more often then not these are salmon that have been pushed down by the bright rays of the sun. Once the downriggers have been lowered, the dipsys need to be moved back to attain greater depth. In the same fashion as the downriggers, lengthen the leads every few minutes, until the fish are relocated. If you have dipsy rods that are spooled with wire or braid, now is the time to put them out to achieve greater depth. After this is done the next step is to increase the depth of your long lines, which is surely the most time consuming of the three. This can be done in a variety of ways, all of which can be equally effective. If you are running short lead core lines or surface lines, they need to be taken deeper by either letting out more colors of lead core or by attaching a weight to the line. Adding a weight to the line can be done with a snap weight (made by Off Shore Tackle), or by simply with a rubber band. Experiment by placing a weight (usually between 4 ounces and 1 pound) to the line about halfway from the rod tip to the lure. This method is simply trial and error, just remember that the warmer the water, the deeper the fish likely are going to be. Finally, if you have copper line this is the time to deploy it. Copper gets significantly deeper than lead core with the same length of line out. This is a great advantage when fishing in heavy boat traffic where boat to boat tangles become an issue. Whichever method you choose to get deeper, it is crucial that you do so after the sun rises. If after you have completed these tasks you still find yourself struggling to catch fish, the lure choice must now be looked at. When fishing shallow water in the early mornings plugs are usually very effective, but seem to lose their effectiveness when taken out to deep water. Generally speaking spoons and rotators with flies or squids have much greater success in the deeper water. 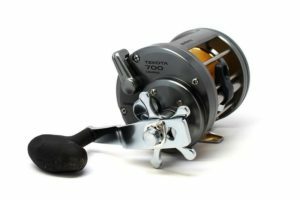 The final piece of the puzzle is one that has been used by anglers on Lake Ontario for years, but has only become popular in Michigan in the last couple of seasons. The method I am speaking of is fishing with cut-bait, and during the daylight hours it will out produce any other lure nearly 100 percent of the time. If you are not familiar a meat rig is similar to flasher and fly combination, but instead of a fly it uses a strip of herring on the leader following the flasher. This combination is lethal during periods of high sun, and low fish activity. The rigs that I have had the most success are the 10 and 13 inch King Flashers that are made by Capt. John King out of Manistee. Running them is as simple as running a standard flasher and fly combination. I have found that they work best on downriggers that are set very deep, anywhere from 80 to 175 feet down. It sounds like Lake Trout territory, but more often than not these bring up big four year old kings. So next time the bite slows for you, simply follow these steps and you will be on your way to greater success, and a cooler full of salmon. There is nothing better than driving back to the harbor after a good day of fishing.